Review: "Humble Pie: Joint Effort" - Sea of Tranquility - The Web Destination for Progressive Music! Though it's being touted as the long awaited release of an album recorded by Humble Pie in 1974-1975 that was rejected by their label A&M and shelved in the vaults for all these years, the truth of the matter that these sessions have been previously released well over a decade ago as Running With the Pack courtesy of Burning Airlines & Alchemy Entertainment, along with four live tracks from the same era. Whether Joint Effort, as it is now being called thanks to Cleopatra Records, or the prior version are either completely 'official' or not is neither here nor there, but for the Humble Pie fan, these sessions will be of immediate interest. Featuring the line-up of Steve Marriott, Greg Ridley, Dave 'Clem' Clempson, and Jerry Shirley, these sessions were recorded at their studio Clear Sounds, and sees the band moving more into the R&B and soul directions that would permeate the latter part of their career. Pretty much half original material and half covers, Joint Effort is a solid affair that has a lot to offer. "Think" of course is a James Brown song, and the Pie deliver the funk in a big way on this rendition, guitars crisp, horns a-blazin', and Marriott singing up a storm. "This Ol' World" and "Midnight Of My Life" are two band originals, and again signal the more soulful direction the band were moving in, while Betty Wright's "Let Me Be Your Lovemaker" is gutsy, bluesy hard rock fun, the bass & guitar thick, Hammond organ sizzling in the background, Shirley's drum work tight, and Ridley taking the lead vocal spot and doing a fine job. This song would also pop up on the bands 1975 release "Street Rats" in an even heavier arrangement. The Beatles classic "Rain" is up next, and it's a fiery and raucous rendition by the Pie, Marriott singing up a storm, and this is followed up by a Marriott composition "Snakes & Ladders" that rocks quite hard and is easily one of the top tracks here. Honky tonk piano permeates the bluesy "Good Thing", Ridley again on lead vocals, and it's Greg's piece "A Minute Of Your Time" that actually provides the sessions most emotional moments, a bluesy soul number with poignant vocals, piano, and horns. "Charlene" is an upbeat Marriott penned funky hard rocker, guitars from he and Clem tight 'n crisp and his lead vocals snarling, another highlight here on the album. Rounding things off here is "Think 2", a mostly instrumental funk jam interpretation of the Brown classic. Though this Cleopatra reissue doesn't include the live tracks from the prior release, what's on display here is strong enough and stands well enough on its own. 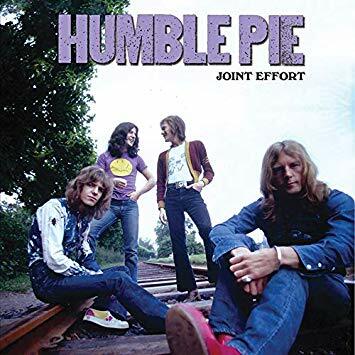 Though this is far from 'vintage' Humble Pie, the life on the road, the drugs, the alcohol, and everything certainly taking their toll on the band, Joint Effort still has plenty to recommend, and it's a complete mystery as to why A&M decided to pull the plug on this album back in 1975, as it easily stands up to some of the releases that came right before it and after it. One more odd thing about this Cleopatra release- pictured in every group shot on the CD is the Peter Frampton version of the band, Clempson nowhere to be found anywhere, which is an epic fail on the labels part.